Licensed Battlefield Guide Phil Lechak begins our tour at the northeast section of the Giant Parking lot, near the wayside exhibits about Camp Letterman. 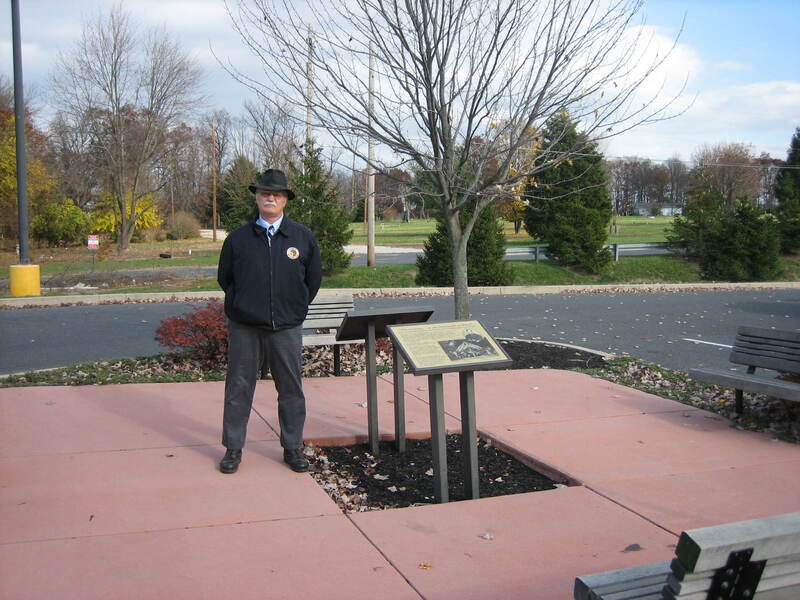 Phil is a native of Connecticut, and although he did not have any relatives who participated in the Civil War, he has closely followed the history of the 14th Connecticut Infantry Regiment. This view was taken facing northeast at approximately 2:30 PM on Sunday, November 9, 2008. Treatment of the wounded at Gettysburg after the battle was left up to the mercy of the Army of the Potomac. 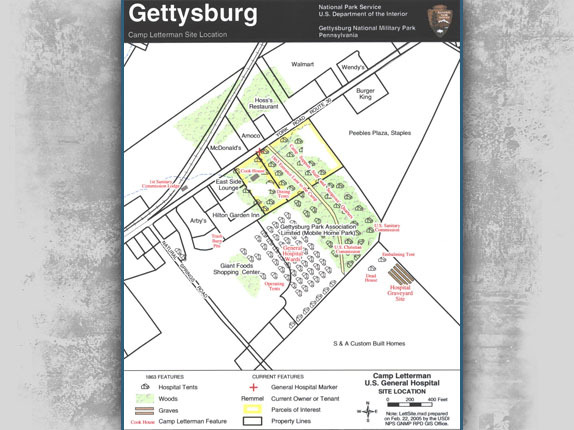 The army’s Assistant Adjutant General, Seth Williams, issued orders on July 5, 1863 to establish a general hospital in the Gettysburg area, and to provide transportation and supplies to the site for treatment of the wounded. 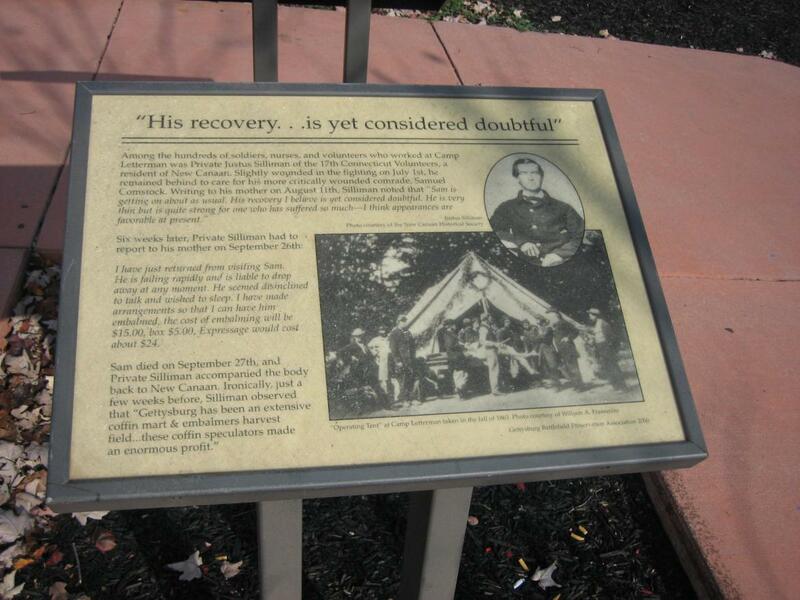 The temporary hospital was named after Dr. Jonathan Letterman, Medical Director for the Army of the Potomac. 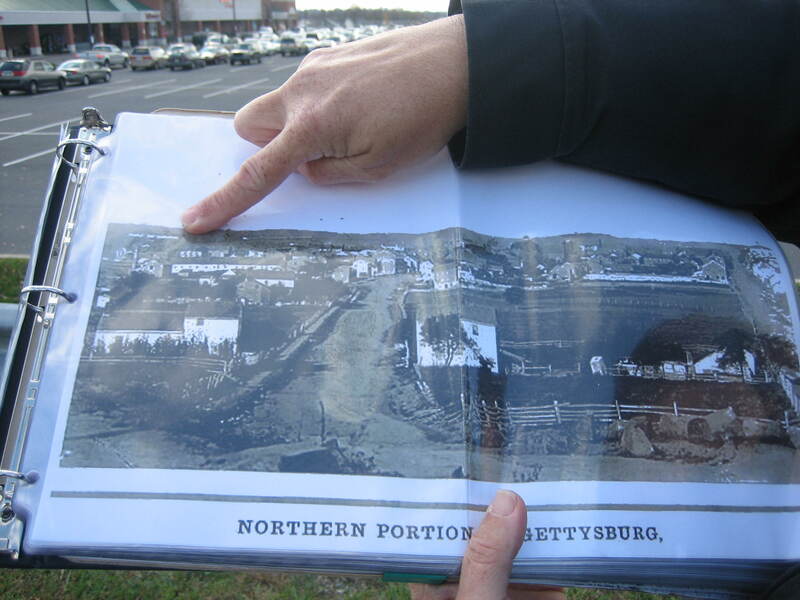 The site chosen for the vast hospital camp was on the George Wolf Farm, roughly one and one-half miles east of Gettysburg on the York Pike. The farm was adjacent to the main road and the railroad where a depot was established. 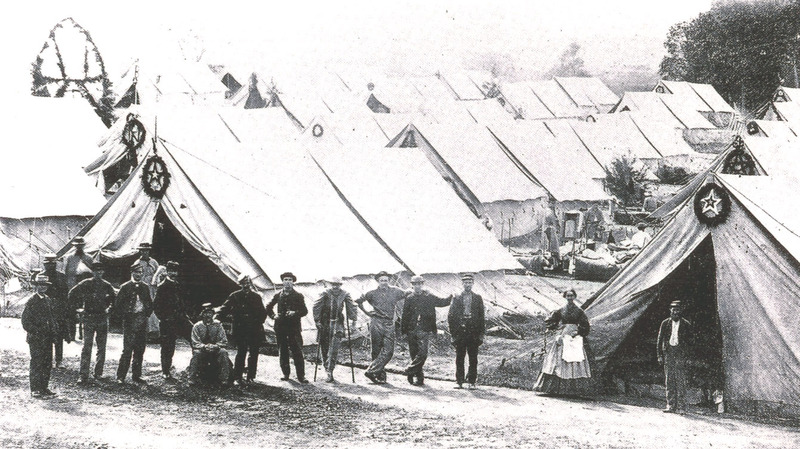 Arriving trains would deliver a continual flow of supplies for the Gettysburg camp and transport convalescents to permanent hospitals in Philadelphia, Baltimore, and Washington. Wolf’s farm had good drainage, water and a ready source of firewood. Remember to click on any of our photographs to access a larger image. To contact Phil Lechak, click here to reveal his email address. Camp Letterman Part 2 on November 17, 2008. National Park Service seasonal ranger program on Civil War Medicine on August 5, 2008. 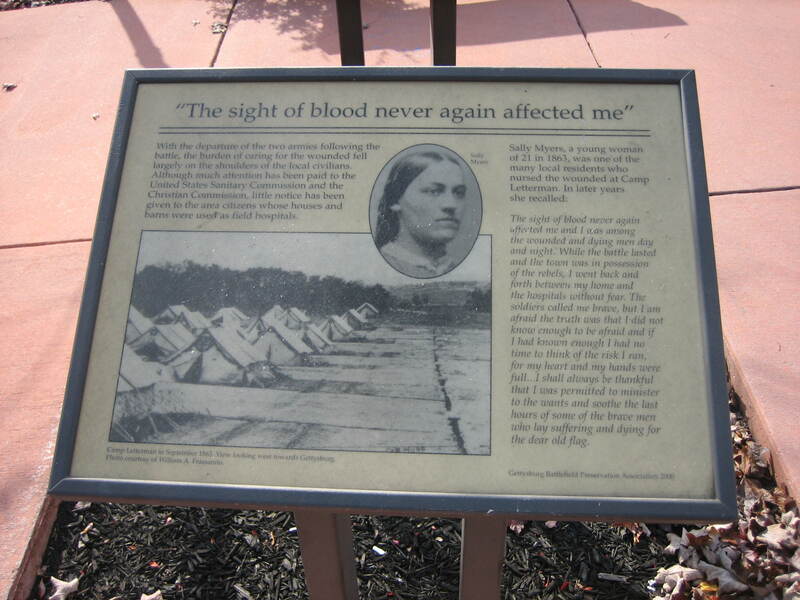 National Park Service seasonal ranger program on nurse Salome “Sallie” Myers on August 1, 2008. National Park Service seasonal ranger program on nurse Cornelia Hancock on July 24, 2008. Video #1 shows Licensed Battlefield Guide Phil Lechak introducing the Camp Letterman site to us. Phil retired after spending 37 years working for the United States Postal Service. Phil first came to Gettysburg in 1999 and had Paul Cooksey as his guide. 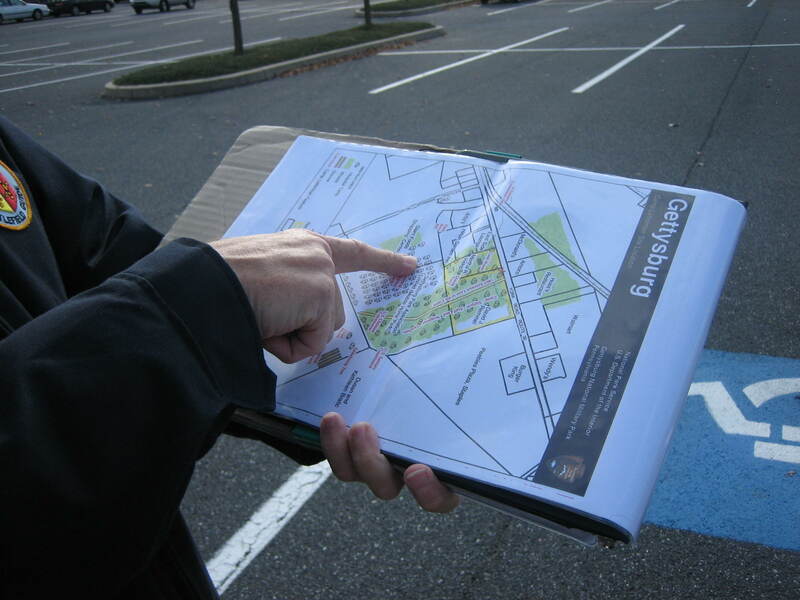 Phil became a self-described “Gettysburgaholic,” and decided to study to become a Licensed Battlefield Guide. He passed the December 2004 exam, and was Licensed in November of 2005. He started as a part-time Guide, but became full time when he retired in January, 2007. View facing northeast at approximately 2:30 PM on Sunday, November 9, 2008. 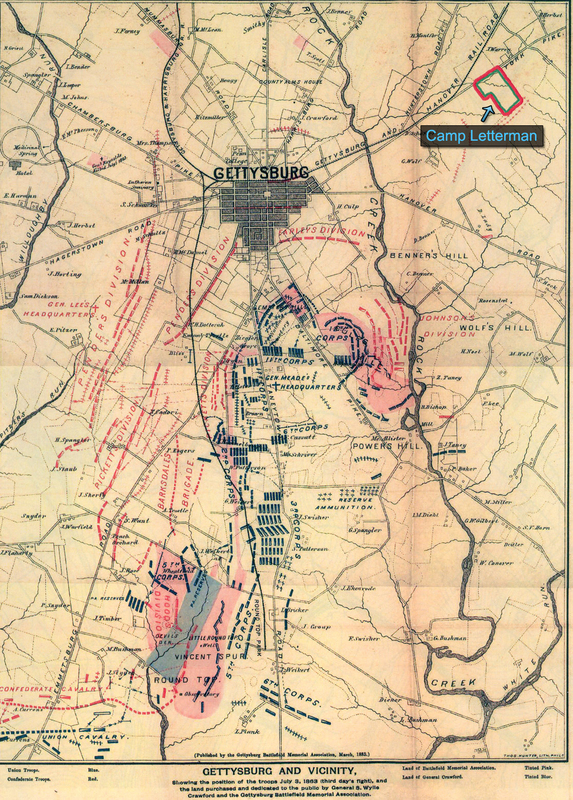 This map of the Gettysburg Battlefield on July 3, 1863 also shows Camp Letterman to the northeast of town. Camp Letterman, of course, was not in existence during or immediately following the battle, as the wounded of both armies were cared for in approximately 160 different locations. 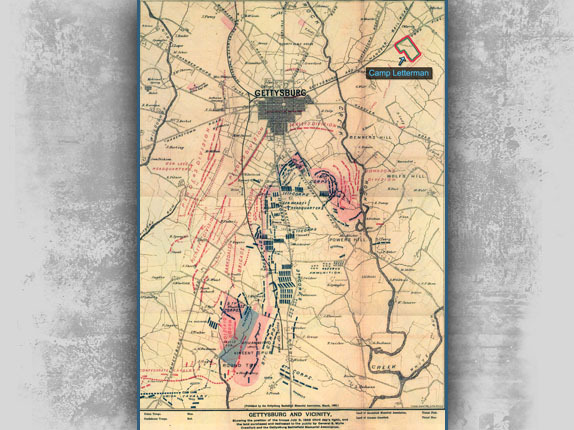 This map was published by the Gettysburg Battlefield Memorial Association in March 1883. 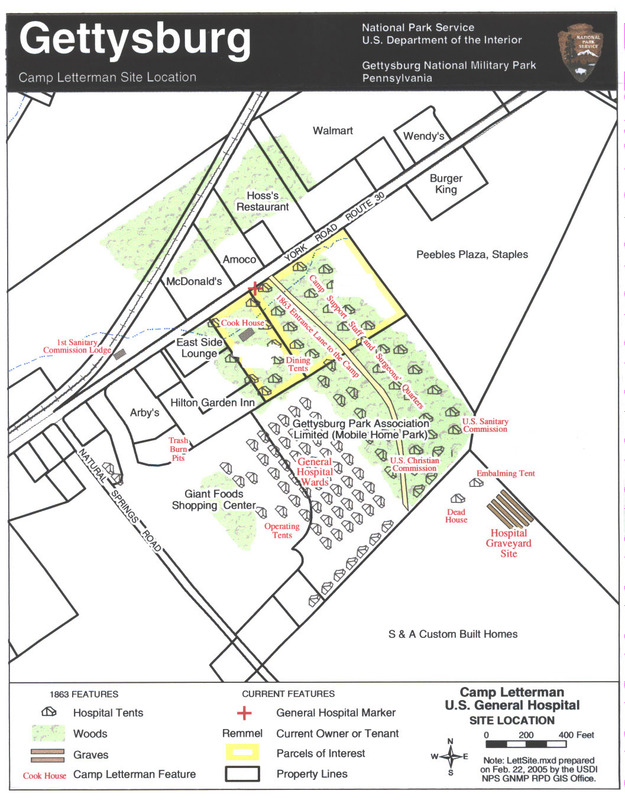 This map created under the supervision the National Park Service’s Curt Musselman in 2005 shows the Camp Letterman area with modern locations labeled. 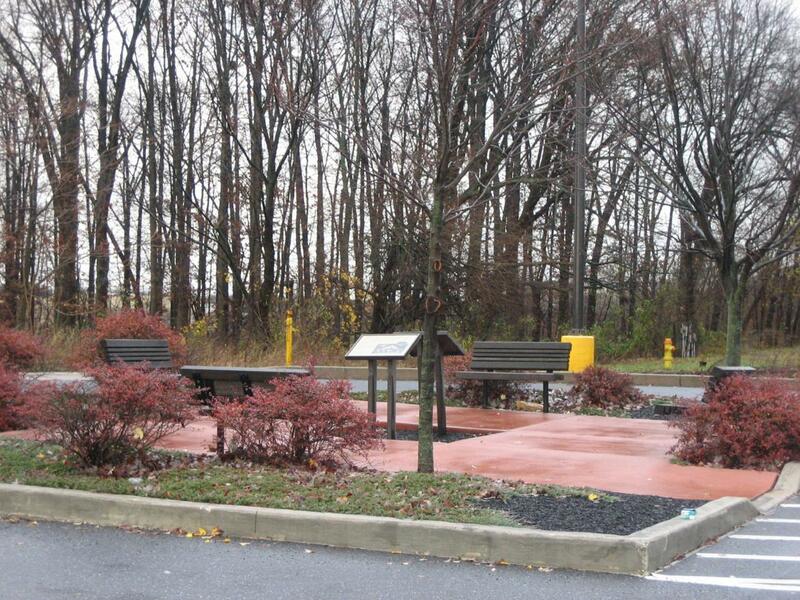 The Gettysburg Park Association Limited (Mobile Home Park) no longer exists. The mobile homes are now gone. This map was created on February 22, 2005 by the United States Department of the Interior, and the National Park Service. 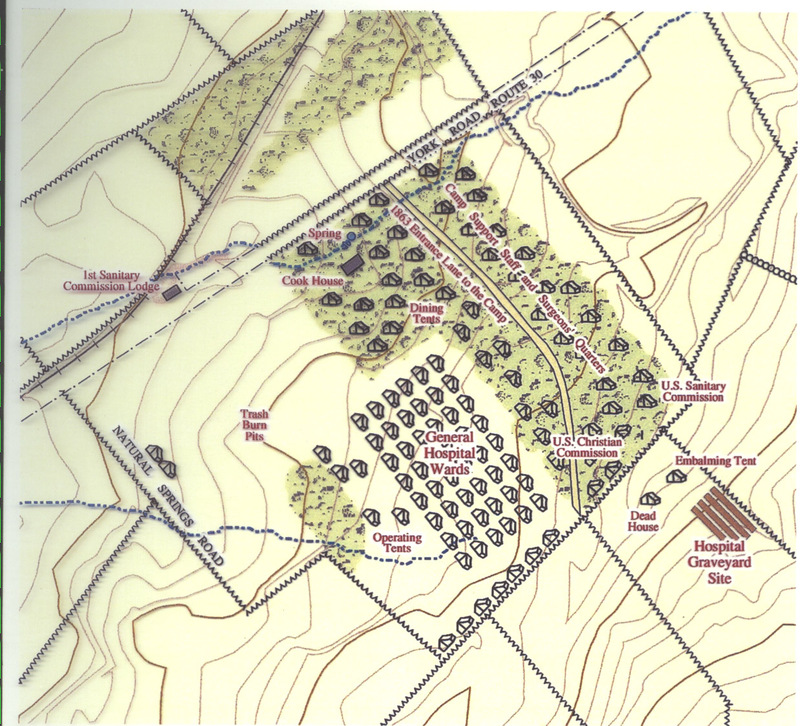 This map shows Camp Letterman in 1863 with different locations within the camp labeled in red. This map was created on February 22, 2005 by the Department of the Interior and the National Park Service. This is a view of the site with locations where we took the videos numbered inside a white star. The mobile homes are no longer in this location. This map was created on November 15, 2008. 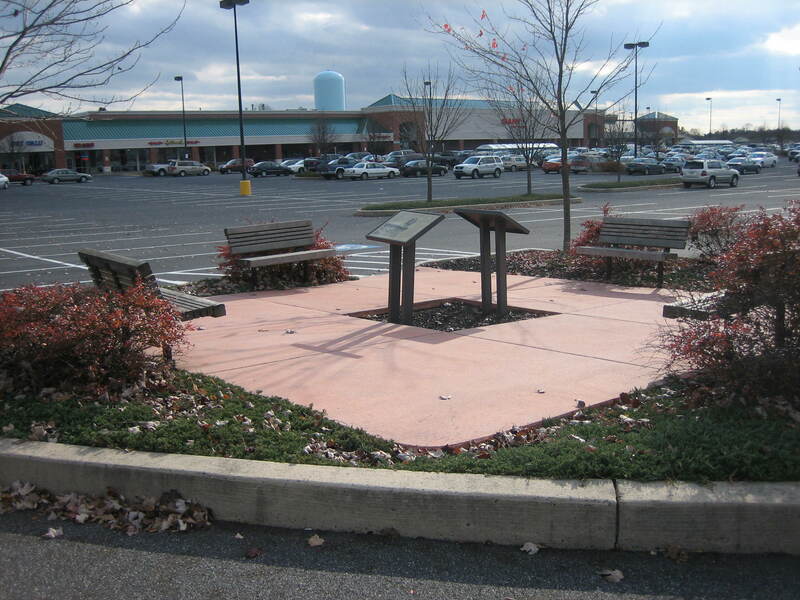 The location where Phil Lechak was standing, by the waysides for Camp Letterman northeast of the Giant Grocery Store. View facing southwest at approximately 2:30 PM on Sunday, November 9, 2008. 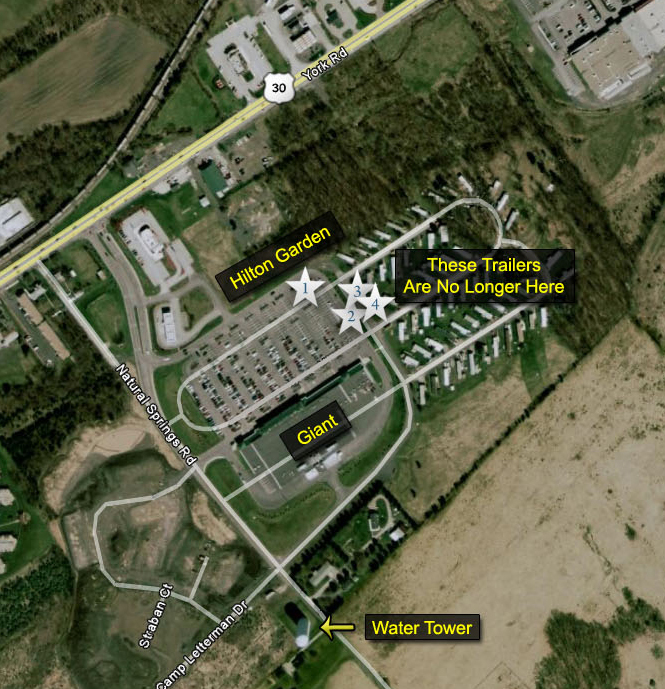 The waysides are also located southeast of the Hilton Garden Inn. View is facing southwest at approximately 2:30 PM on Sunday, November 9, 2008. Here is the southwest wayside. View facing northeast at approximately 2:30 PM on Sunday, November 9, 2008. Here are the waysides on a rainy Saturday with the northeast woods at the Camp Letterman site in the background. View facing northeast at approximately 3:30 PM on Saturday, November 15, 2008. 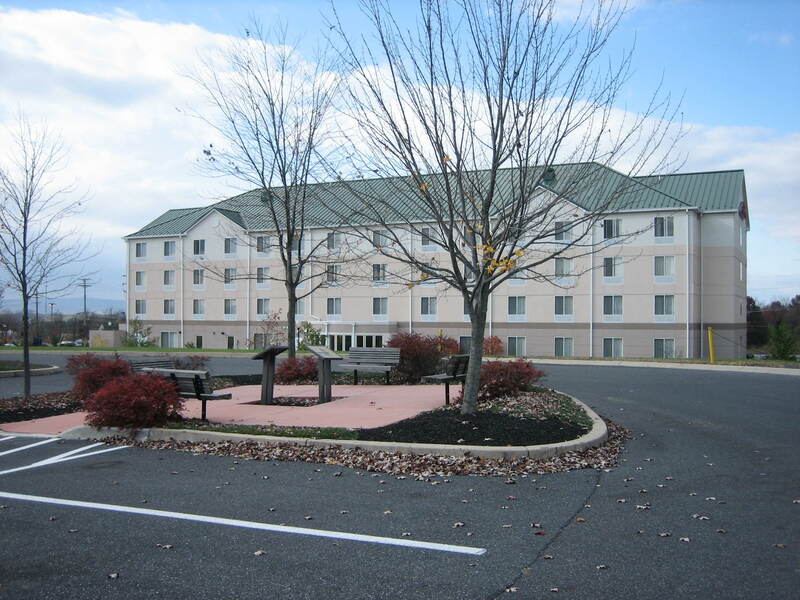 Here is the northeast wayside. View facing southwest at approximately 2:30 PM on Sunday, November 9, 2008. 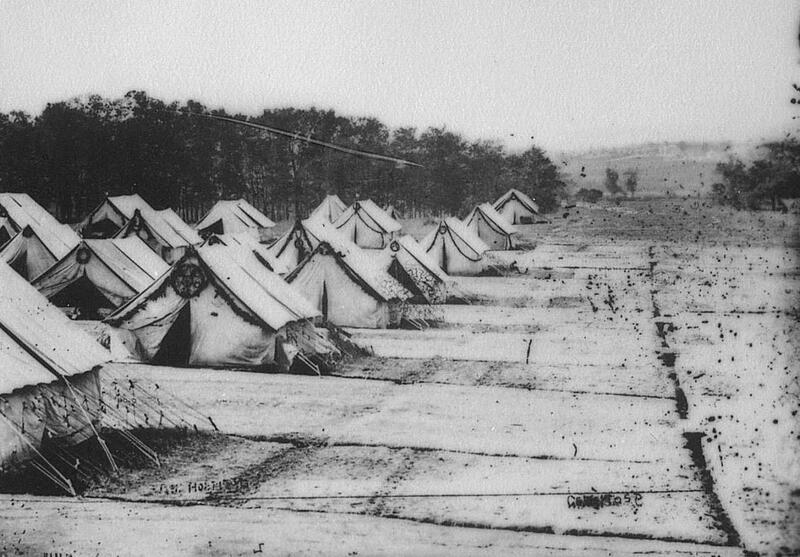 On the maps is a group of tents labeled “General Hospital Wards.” The tents on the map are not to scale, and there were more tents than are shown here. The map shows 48 tents, but in actuality there were six rows of tents with 17 to 18 tents in each row, or approximately 102 tents. 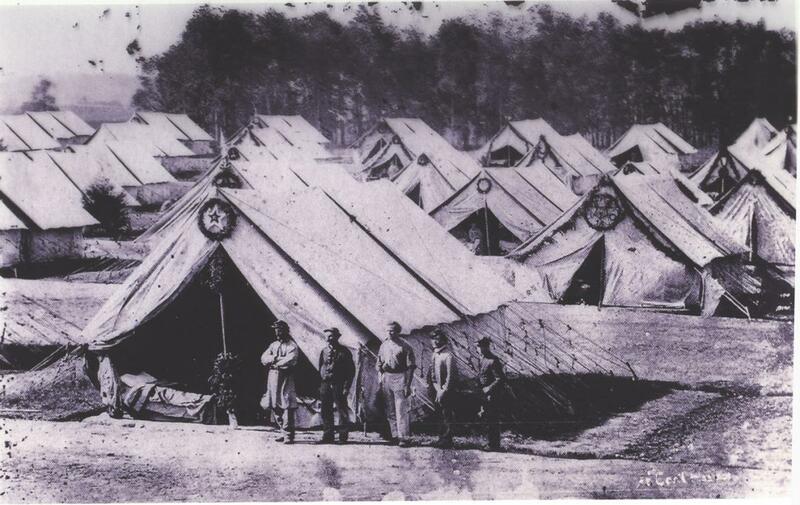 The Tyson Brothers took a five photograph panorama of these tents in late September, 1863. 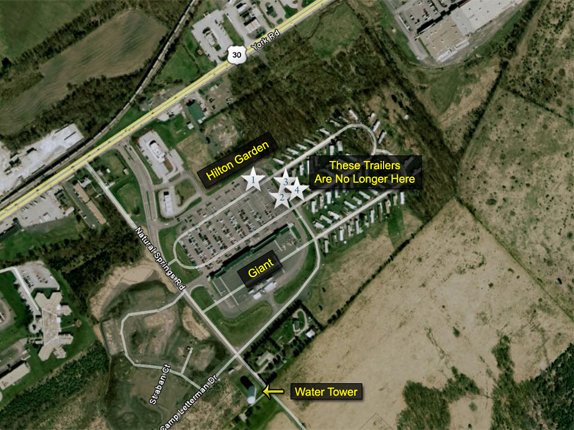 Here is the picture showing tents farthest to the southwest. View facing southwest in late September, 1863. This Tyson Brothers’ photograph is just to the right of the previous photograph. The tents were 15 feet wide. Double tents were 28 feet long, and single tents were 14 feet deep or long. View facing southwest in late September, 1863. This Tyson Brothers’ photograph was taken just to the right of the previous photograph. There was ten feet between tents in each row. Each tent is decorated with fresh boughs of cedar to ward off insects and cleanse the air. View facing southwest in late September, 1863. The avenues between the rows of tents were approximately 30 feet wide. This view was taken to the right of the previous view. View facing southwest in late September, 1863. This is the fifth of the panorama of five Tyson Brothers photographs. 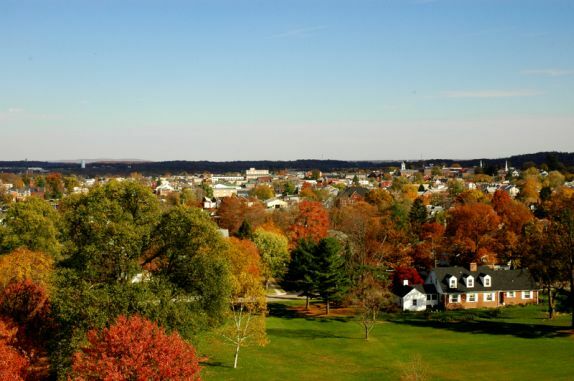 The town of Gettysburg is in the right background. View facing southwest in late September, 1863. Phil Lechak taped together the photos to give us an idea of what this area looked like. View facing southwest in late September, 1863. 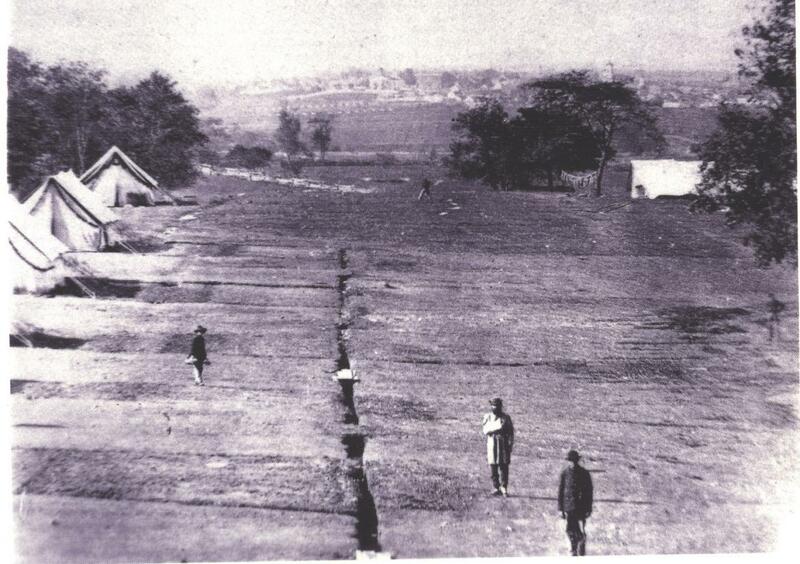 When the Tysons took those photographs in September, 1863, they were standing in an area on the other side of the guard rail, approximately halfway up the paved road near the first bush on the right. Most of the tents were in this area. 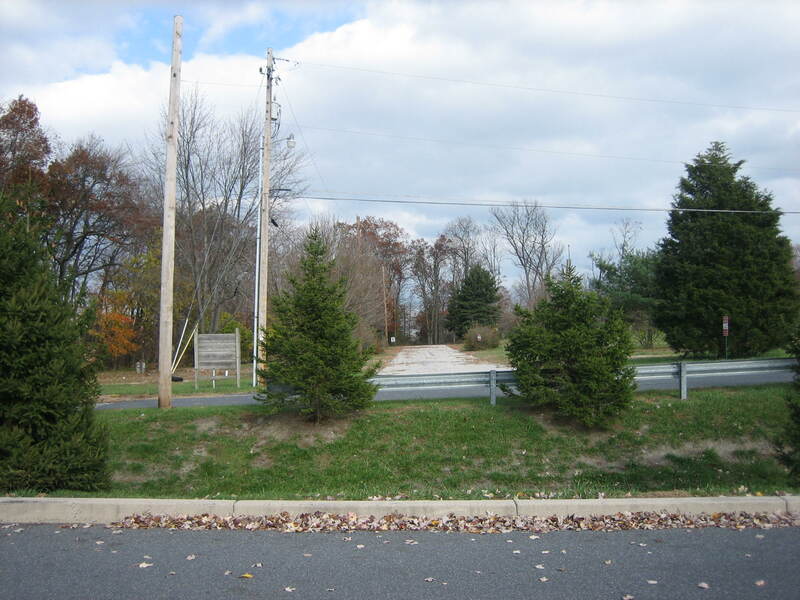 We can’t go on this property to show you exactly where it was taken because it is private land. This view was taken facing northeast at approximately 2:30 PM on Sunday, November 9, 1863. 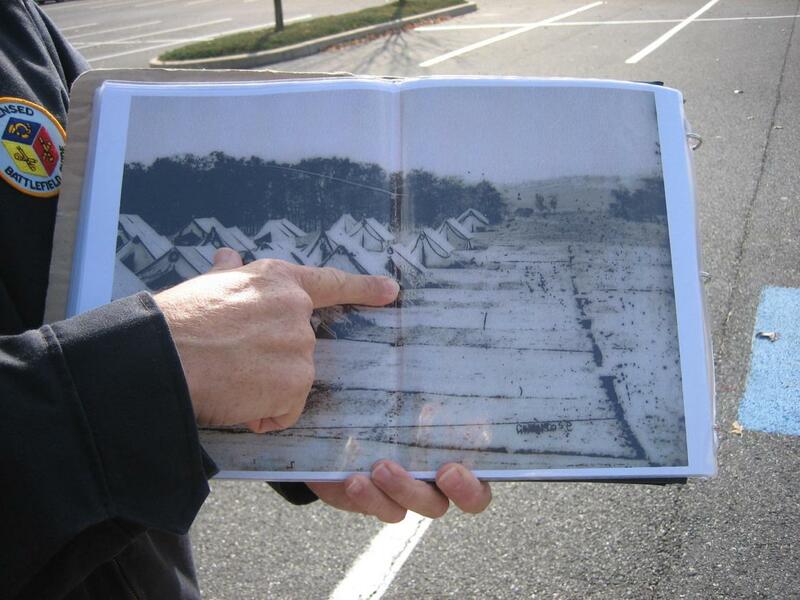 But some of the tents in the Tyson Brothers’ photographs are in the Giant parking lot. 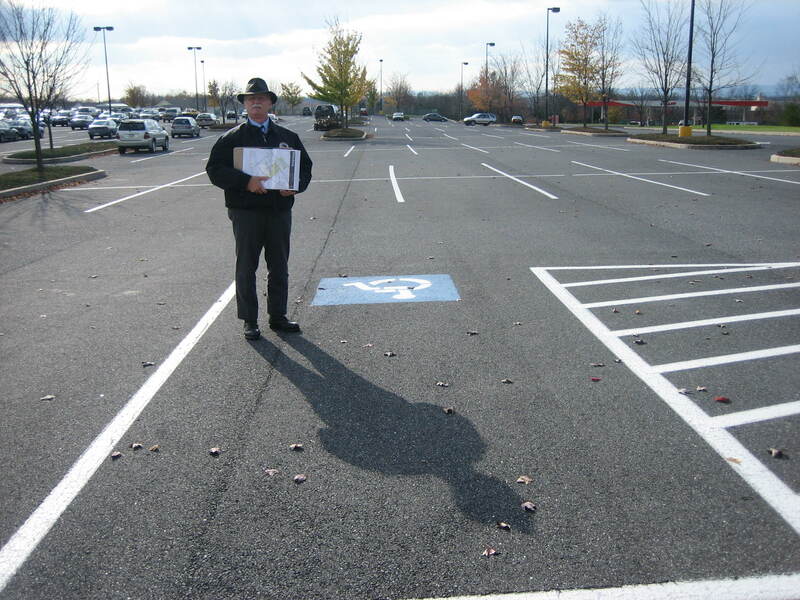 Phil is standing on a handicapped spot in the parking lot where one of the tents was located. View facing southwest at approximately 2:30 PM on Sunday, November 9, 2008. Phil shows us the area where he is standing on the National Park Service Map. View is facing southwest at approximately 2:30 PM on Sunday, November 9, 2008. 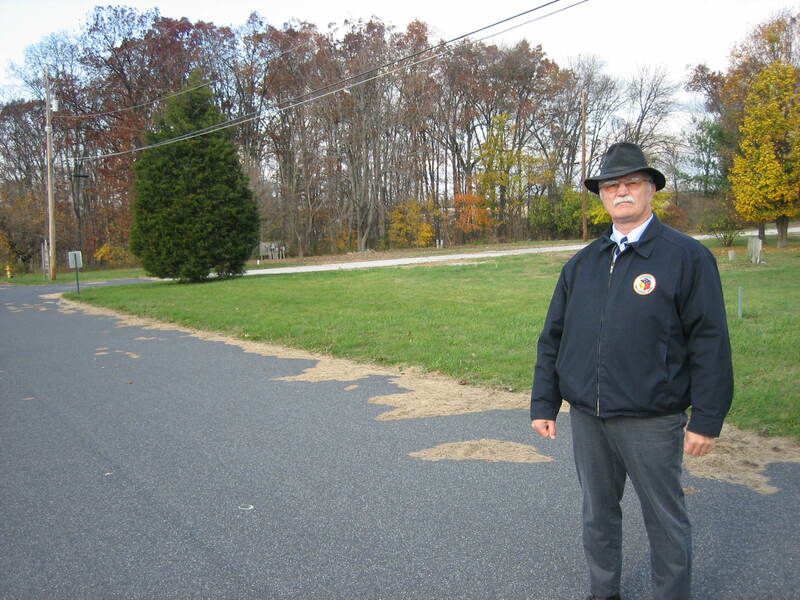 Here LBG Phil Lechak is pointing out the tent location in Tyson photograph #4 where he was standing. View facing southwest at approximately 2:30 PM on Sunday, November 9, 2008. We’re now leaving the parking lot, and walking on a road that is at the edge of the private property. 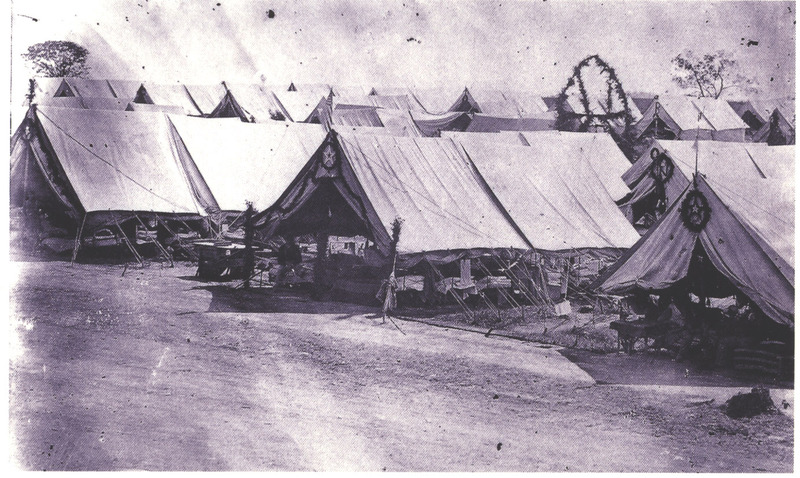 On the National Park Service Map listing modern locations as well as Camp Letterman locations, this road is the black line running through the row of tents of the General Hospital Wards. View facing east at approximately 2:30 PM on Sunday, November 9, 2008. 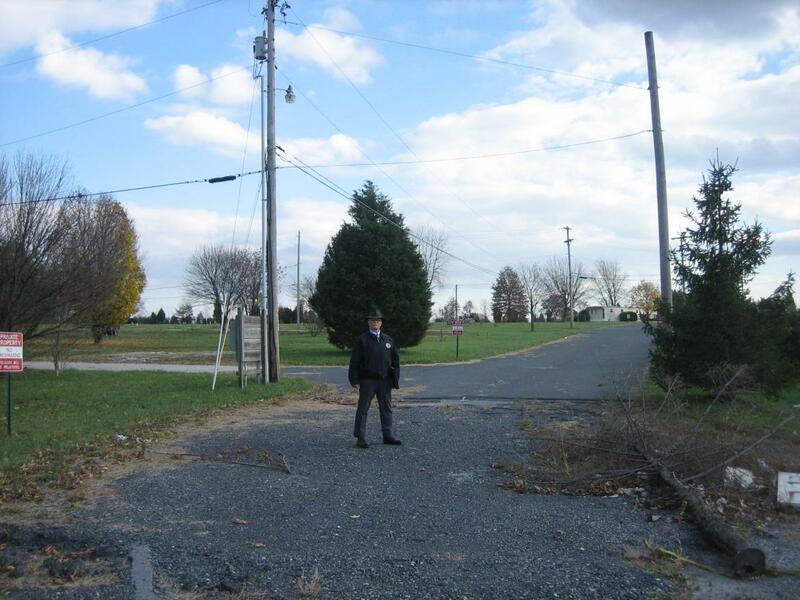 Standing in the road, Phil is pointing out the grassy area where most of the General Hospital Ward tents were located. View facing northeast at approximately 2:30 PM on Sunday, November 9, 2008. 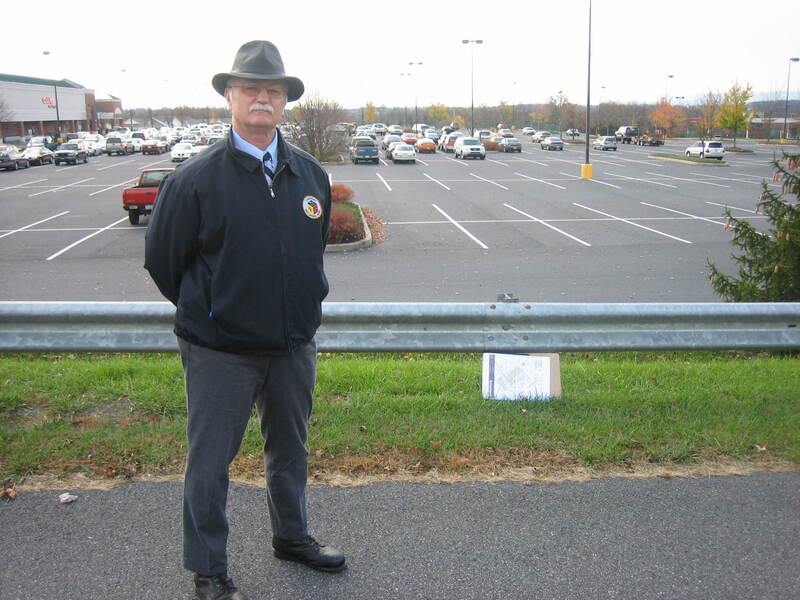 Phil Lechak is now standing on the road above (northeast of) the Giant Parking lot. The Borough of Gettysburg is behind the trees in the right background. View facing southwest at approximately 2:30 PM on Sunday, November 9, 2008. In Video #2, Phil explains some of the advantages of placing Camp Letterman in this location. View facing southwest at approximately 2:30 PM on Sunday, November 9, 2008. The cameraman is standing in the same location, but now facing to the northwest looking to the York Road. View facing northwest at approximately 2:30 PM on Sunday, November 9, 2008. In Video #3, Phil is pointing out other advantages to having Camp Letterman located here. The wind was blowing hard, and a section that might be difficult to hear is when he was talking about the springs located in the woods. View facing northwest at approximately 2:30 PM on Sunday, November 9, 2008. In Video #4, Phil is standing in the area of the General Hospital Ward, and explaining that Camp Letterman’s purpose was to have the convalescents ready to be placed on railroad cars to take them to other locations. This view was taken facing northeast at approximately 2:30 PM on Sunday, November 9, 1863. 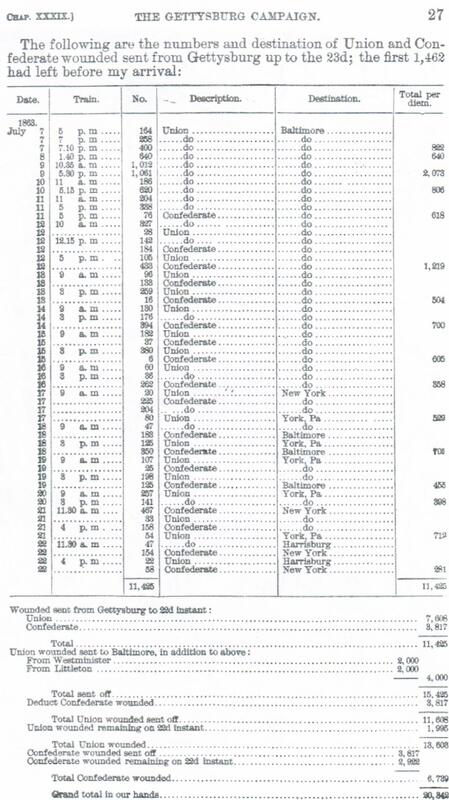 Here is a copy of the “train inventory” that Phil was talking about in the previous video. 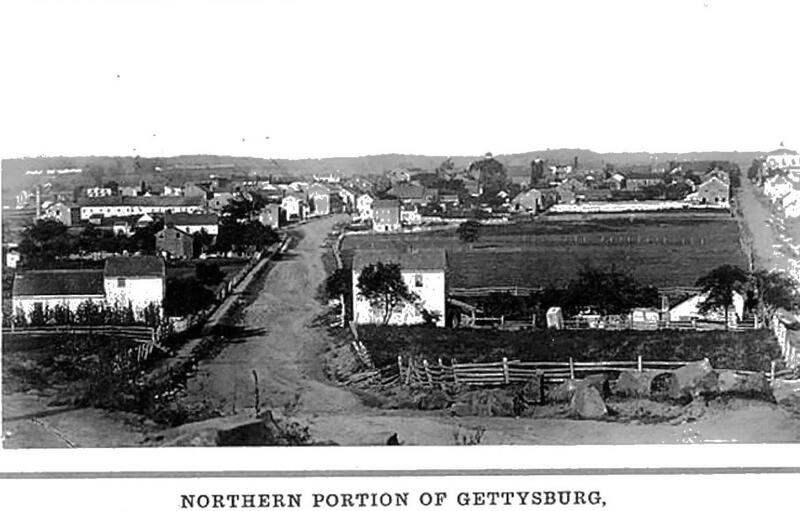 Camp Letterman is visible in this photograph of the Borough of Gettysburg taken from Seminary Ridge by the Tyson Brothers in August, 1863. View is facing east in August, 1863. 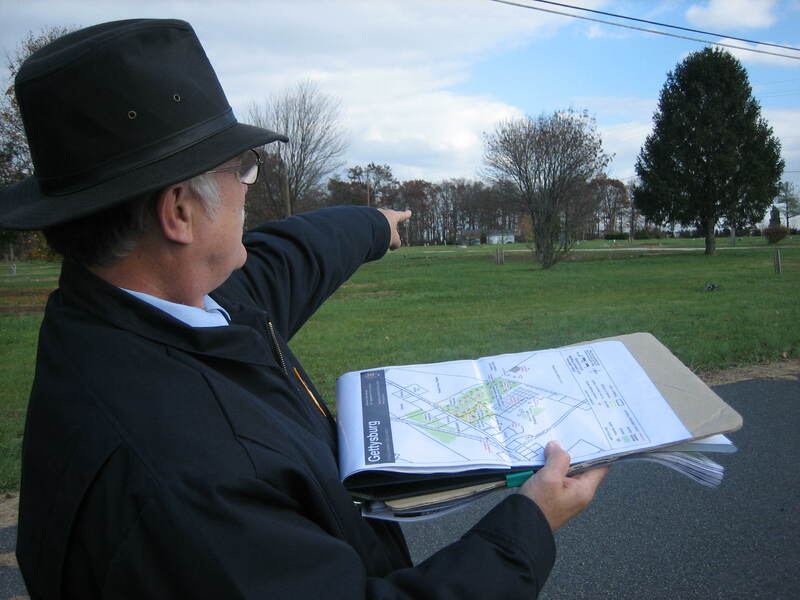 Here LBG Phil Lechak is pointing out the tents at Camp Letterman for us. View facing west at approximately 2:30 PM on Sunday, November 9, 2008. In this photograph taken from the Seminary Cupola, the Camp Letterman sight is near the light green or light blue water tank in the left background. Photo courtesy of Phil Lechak.